Rivers play an important role in our ecosystem. They provide water for drinking and irrigation of crops, a habitat for fish and other organisms, and routes to easily transport goods. For these reasons and more, it is important to monitor the quality of river water, including its physical, chemical, and biological characteristics. One often measured parameter is specific conductance. Conductance is a measurement of a substance’s ability to conduct electricity and is related to the amount of ions, like salt, that are dissolved in the water. Where rivers meet the ocean, the salt typically comes from seawater flowing upstream into the river. How far upriver the saltwater can reach (often called the salt front or salt line) depends greatly on an estuary’s type and the current streamflow. Further upstream, where the ocean doesn’t have as much influence, the amount of dissolved salts in river water is generally related to how much precipitation there has been. When rainfall is light, more water on land can evaporate before it reaches the river, which concentrates the amount of dissolved salts in the water that remains. When rainfall is heavy, water tends to flow more quickly into rivers and streams, with smaller concentrations of dissolved salts. 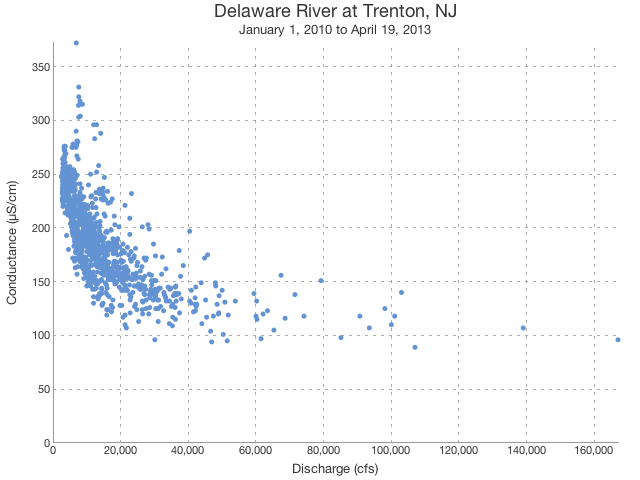 The image above shows the relationship between river flow (discharge) and conductance over a 3+ year period on the Delaware River in Trenton, NJ. In general, the conductance is quite low, and well below accepted salt front cutoffs of ~400-1,000 micro-Siemens per centimeter, which correspond to chloride concentrations of 100-250 milligrams/liter. However, there is clearly an inverse relationship between conductance and discharge. When discharge is strong, water conductance is low, though it never gets below ~100 µS/cm. Likewise, when discharge is light, conductance is 2-3 times higher. 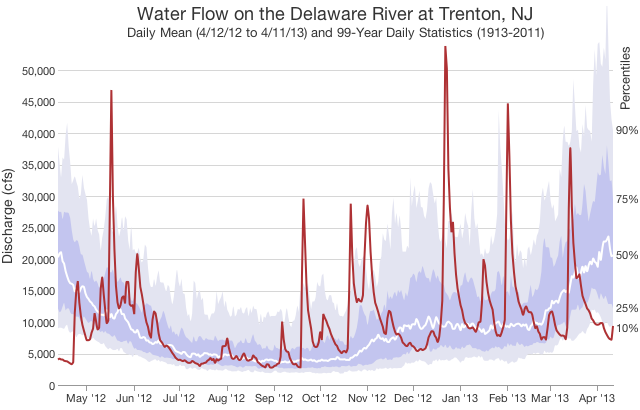 While the salt concentration on the Delaware River near Trenton is generally low, it does depend on the streamflow. 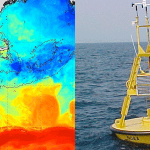 Knowing the location of the salt front is important, especially on rivers where water is drawn for human consumption or irrigation, and for protecting riverine infrastructure like ships that corrode more easily in salty water. The Delaware River Basin Commission regularly monitors the salt front location in order to control its location by storing and releasing water in reservoirs upstream. Scientists who study river streamflow do not have an easy job. 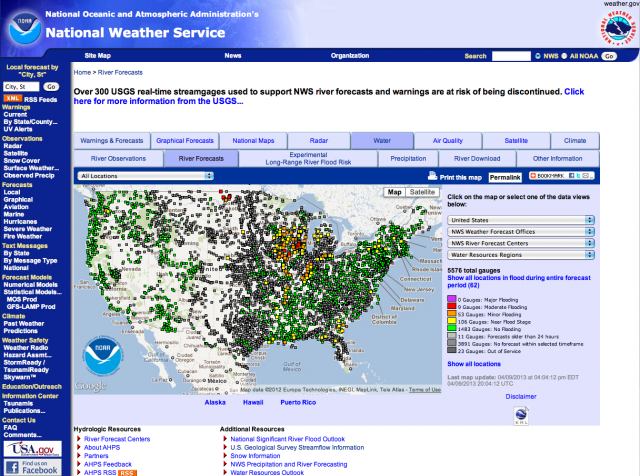 Unlike many weather measurements like temperature, pressure or humidity that change with more predictable variation throughout the course of a year, streamflow is more closely correlated with major rain and snow events. These events occur sporadically throughout the year, often in large doses. 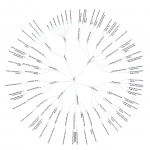 The graph above is a good example of this complexity. 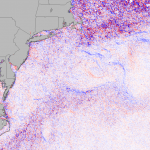 The data shown was measured from a stream gauge on the Delaware River in Trenton, New Jersey. 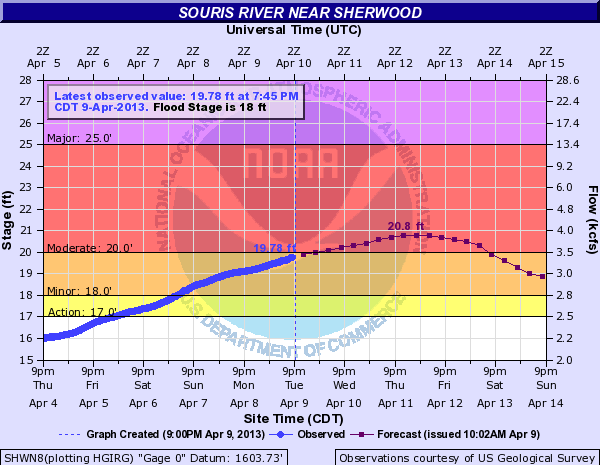 The daily mean streamflow (also referred to as “discharge”) from the most recent year is plotted in red, ending April 11, 2013. 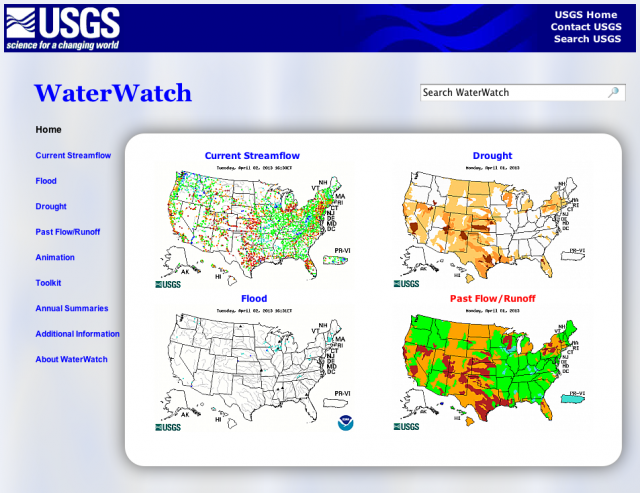 The long-term average streamflow statistics are calculated from a 99-year data set collected between 1913 and 2011. The mean daily streamflow includes many large peaks over the course of the year. 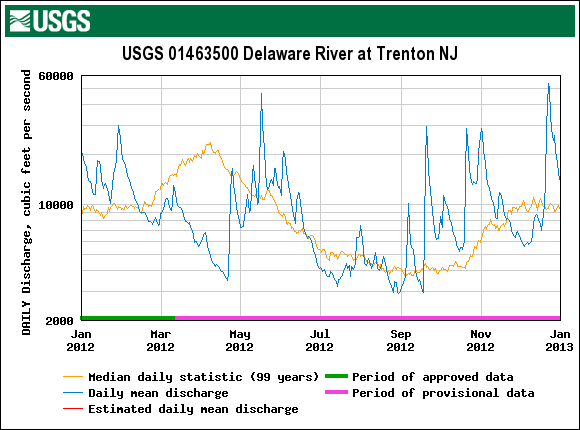 These peaks correspond to major precipitation events that occurred in the upper Delaware river basin. On the other hand, the lines showing the long-term average streamflow change more gradually throughout the year, with the highest streamflows observed in the spring (especially this week), and lower streamflows in the summer and fall. Looking at this data, several interesting observations can be made. 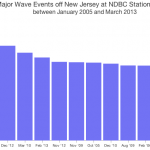 In October 2012, Hurricane Sandy hit New Jersey causing extensive damage, however the observed streamflow during this time was not as high as some of the other events. As it turned out, most of the damage was caused by coastal flooding and high winds and not from flooding rivers. 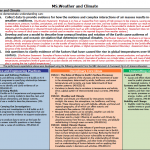 Over the course of the winter, several large events were observed. 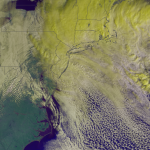 These correspond to the major nor’easter’s that passed through the area, including the (strangely-named) winter storms Nemo and Saturn. 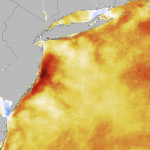 Last month was unseasonably cold and, while there was a nor’easter early in March, the month also ended up unseasonably dry. However, following today’s rainstorm, it is likely that the streamflow will rise to the more typical values expected during this time of year. Ultimately, when studying rivers it’s important to remember that individual events will not always neatly line up with long-term averages, but over time, the trends should match.